Discussion in 'Beginners Forum' started by WMAC, Jan 5, 2013. Most modern lights use an LED instead of an incandescent bulb. LEDs are a specific type of semiconductor, called light emitting diodes. The reasons modern lights use LEDs are that they are more durable and use less battery power to output the same or more light compared to traditional bulbs. Light output is measured in "Lumens" and the power source is measured in watts. LEDs are designed to handle a specific number of watts, so, an emitter that can handle more watts is one that can potentially output more lumens. Building a light with an LED is a little more complex when compared to a traditional incandescent bulb. Remember doing an experiment with a battery and a light bulb back in science class? It was simple. Touch a positive wire to the bulb and positive pole of the battery and a negative wire to the bulb and negative battery pole and you have light. Well, that doesn't always work with LEDs because they are directional, meaning, the current only flows one way. They also only operate within a specific current range or else: they will emit light inconsistently, they could get too hot or even burn out immediately. The reason is LEDs are current controlled devices and you must deliver a consistent current to the LEDs over a range of load voltages to maximize their potential. To accomplish this, modern LED lights use "drivers" instead of resistors. The reason resistors aren't used is because the current and voltage in resistors are linearly related whereas the current flowing in an LED is an exponential function of voltage across the LED. In other words, a small change in voltage can produce a huge change in current. This is important because you want your light to deliver a consistent beam regardless of battery power. With a resistor, it would only limit the maximum current delivered, but would get exponentially more dim as the battery delivers power. Therefore, you need to take the driver into consideration when purchasing the LED because overdriving an LED a little will degrade it substantially. This means it will deliver 280 lumens when supplied with 700 milliamperes of current. It can still operate efficiently at 1,500 milliamperes and should be able to handle 3,000 milliamperes before it burns out. So, why not just run it at 3,000 milliamperes?In most cases, driving the LED at a higher current will not produce substantial additional light. Instead, the junction (the working parts of the LED) has to dissipate the excess power as heat. 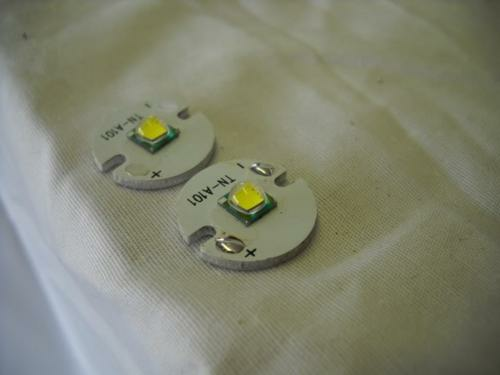 Heating the junction will decrease its useful life, and can reduce the output of the LED substantially. Heating it enough will cause catastrophic failure (producing a dark emitting diode). Some may give a rating in volts, like 5V. These are really not rated to operate continuously at 5V in most cases. It is better to spec your LED in terms of current, not volts. The "6,500K - color temperature" is a rating to give an idea of where it is on a scale from how white to how yellow, or more natural (like sunlight), the light appears. This is only a matter of preference. Most modern LEDs are a square emitter embedded in a hemispherical lens. This configuration will emit the light in a fairly even, hemispherical, 180 degree pattern. For the purposes of riding a bike at night, we want to reform the light into a desired pattern using a reflector and optics, also known as a collimating system. Collimating systems enable you to focus the light in a specific pattern. 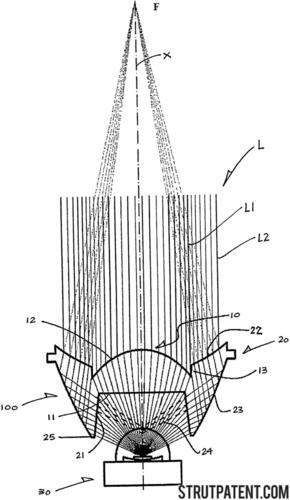 They are the combination of the interaction of the lens (the glass bubble over the emitter) and the reflector (the concave, reflective, surface that focuses the light) and optics (any magnification of the beam emitting from the emitter, lens and reflector). A good collimating system will distribute the light efficiently and evenly with the right amount of throw, hotspot and coma for your application. The amount of throw, coma and spill will be determined by the intensity of the emitter and the configuration of the collimating system. Changing the throw, hotspot and coma is quite simple. To *increase throw, choose an emitter with higher luminance and/or increase the diameter of the collimating system. The depth of the reflector will determine the size of the hotspot and coma. When comparing two reflectors of the same diameter, a deeper reflector has a smaller hotspot and larger coma. Conversely, a shallow reflector has a larger hotspot and a smaller coma. Reflectors come in various levels of quality. Higher quality reflectors are coated in materials that reflect the light more efficiently. Efficiency is measured in terms of how much light is absorbed into the reflector instead of being emitted forward into the beam. At the bottom of the quality spectrum are aluminum coated reflectors with 70%-80% efficiency. Next are silver coated reflectors with 90%-95% efficiency and at the top are the dielectric coated reflectors with 99%+ efficiency. Some reflectors are smooth on the inside and others are rippled. A smooth reflector has more throw than rippled one, but, ripple reflectors have a more uniform beam. 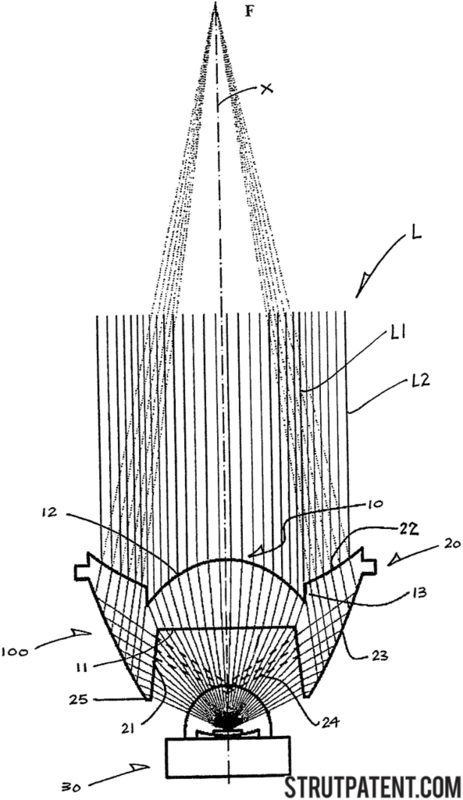 The final piece of the collimating system is the protective lens. This is usually a flat piece of plastic or glass that can sometimes have a magnification "bubble" above the LED. This is usually designed to help maximize luminescence and minimize spill. The next consideration is a power source. 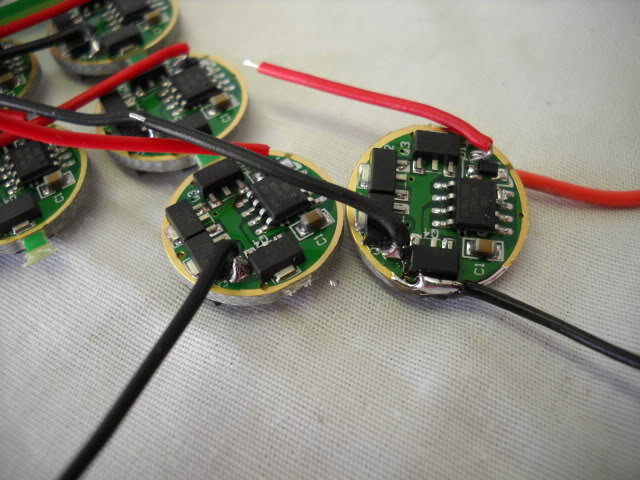 The important factors in choosing a battery pack are milliamperes per hour and volts. *Milliamps Hour (mAh) is important because it's the easiest way to distinguish the strength or capacity of a battery. The higher the mAh, the longer the battery will last. Batteries with different mAh ratings are interchangeable. If your battery is rechargeable then the mAh rating is how long the battery will last per charge. Think of a car. Voltage is how much power is being output by the gas and mAh is the size of the gas tank. *The bigger the gas tank (mAh) rating the longer the device will run. If your battery is rechargeable, then think of the gas tank as refillable (rechargeable). Most modern light systems use Lithium Ion batteries, the same battery technology used in personal computers. They are typically rated something like, 2,500 mAh/3.7V. This means it will output a maximum of 3.7 volts for 2,500 milliamperes hours. The voltage of this battery will drop as the power is being consumed, so, that means the battery power is not linear. If you look closely at the spec sheet, it will say something like: "The voltage of full charge and cut-off discharge is 4.2V and 2.75V." This is exactly why we use a driver, because, without it, we would have a really bright light at full charge and a really dim light as it nears full discharge. However, using the example driver above, it requires at least 6 volts. In order to increase the voltage of the battery pack, you would put the batteries in a "series" and it means exactly like it sounds. You would line them up positive pole to negative pole. Two batteries would yield *2,500 mAh/7.4 volts (actually it would be 8.4 at full charge). Three batteries would yield *2,500 mAh/11.1 volts (12.6V) and four batteries would give *2,500 mAh/14.8V (16.8V). Notice the mAh did not change. If you put them in parallel, a different way of wiring them, two batteries would yield 5,000 mAh/3.7V, three would yield 7,500/3.7 mAh, and four would give 10,000/3.7 mAh. For our use, we would want to put four batteries in a series. *If you don't want a long skinny battery, you can turn them sideways and wire them into a rectangular battery pack, or, any number of configurations to make them fit your housing. Which brings us to the final section - housing. Without it, you would just have a bunch of stuff flopping around. When constructing the housing, you need to remember lights create heat and you need a way to dissipate the heat. A lot of light systems use "fins" to increase the surface area of the housing to allow the air to touch more places and cool the housing more efficiently. You can also minimize the heat by under-driving your LED or using multiple, smaller, LEDs. With this information, you should at least have an understanding of a light system and how the components work together and why. Now, search the Interwebz for a DIY Bike Light Project and see if there's one you'd like to give a try. Good luck! Just curious, do people here build DIY lights? Yeah, splat has built a lot of them, not too many of which have caught fire while on his head. Kudos to him! I find it difficult to get motivated to build some now that you can get okay-ish Chinese lights on ebay for peanuts. Yeah, I'm running one of those now.